The Salmonella typhimurium strain TA1535/pSK1002∗ for use in the SOS/UMU-test is described by Oda et al.1 and is offered in Proprietary Transport Medium (PTM™). Please note: The bacterial strains contained in STDiscs™ and ECDiscs™ are potential etiologic agents and are intended for use only by those skilled in the safe handling of potentially infectious agents. Ames II™ is a brand of BioReliance®. 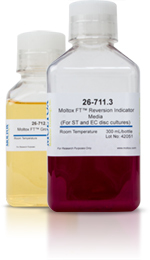 The components are manufactured by MOLTOX®. ∗ According to the German “Gentechnikgesetz” TA1535/pSK1002 has been classified as “genetically modified organism” (GVO/GMO) of risk group 1/BSL1. Please check for appropriate regulations in your country. 1 Oda Y., Nakamura S., Oki I., Kato T., Shinagawa H. Evaluation of the new system (umu-test) for the detection of environmental mutagens and carcinogens. Mutation Research 147(5):219-29, 1985.